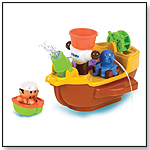 Water toys were named a top trend at the 2015 New York International Toy Fair, and bath toys are at the top of the list. From boats to ducks and everything in between, these on-trend best-sellers were reported to us by 10 specialty retailers across the country. WaterBlocks brings classic block play into a watery environment. The bath tub and pool are the perfect places to create floating towns, bridges, waterslides, ball runs, towers and more. The "sticky" viscosity of water creates a helpful cling between blocks, and the movement, buoyancy and flow of water add an engaging twist to classic block play. The set includes 20 pieces. — Laura Turman, owner of One Two Kangaroo in Shepherdstown, W.Va., told TDmonthly in an April 2012 survey that Waterblocks are their best selling bath toy. — Joe Berardoni, owner of Pun's Toys in Bryn Mawr, Pa., told TDmonthly in an April 2015 survey that floating playsets from Just Think Toys are their best-selling bath toys. Bath time just isn’t complete without our classic rubber duck. Made in Spain of all-natural, phthalate-free latex, the Original Rubber Duck comes in 7 fun and goofy styles. — Dean Smith, owner of JaZams in Princeton, N.J., told TDmonthly in an April 2013 survey that they sell 10 of the Original Rubber Duck each month, making it the store's best-selling bath toy. — David Stelzer, owner of Shananigans Toys in Baltimore, Md., told TDmonthly in an April 2015 survey that Rubber Duckies by Rich Frog are their store's best-selling bath toys. "It's a cute item and the best rubber duck," he told us. These floating drums introduce kids to rhythm while they bathe, and can be pitch-adjusted according to the amount of water in the drums themselves. They come with a waterproof rhythm chart. — “We sell tons of Alex's bathtub musical instruments. A dozen or so [per month],” Mary Porter, owner of The Curiosity Zone in Ashburn, Va., told TDmonthly in spring 2009. 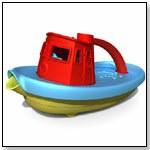 — In March 2009, eight of 64 retailers named instruments by Alex-Panline as their best-selling bath toys. — Alex products are always top sellers for Melody’s Choices, Owner Steve Melody told TDmonthly in spring 2009. “Stock it well and it will sell well,” he said. This set includes a basketball net and three squirting balls. A suction cup rim and mesh net allows the product to be mounted easily to a smooth surface for bath-time fun. —Margy Peine, owner of Tree House Toy Shop in Cumberland, Md. named Rub a Dub Shapes For The Tub as a best-seller in the bath category when surveyed by TDmonthly in late Spring 2011. — In an April 2012 survey about bath toys, five out of 11 retailers named Alex as their best selling brand. — Want this? As of 05/06/2011, this product was available for purchase at Tree House Toy Shop. 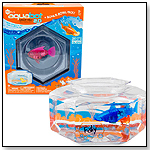 HEXBUG Aquabot 2.0 with Fishbowl by INNOVATION FIRST LABS, INC.
Part pet, part toy, the HEXBUG Aquabot 2.0 provides kids with the fun experience of having a pet fish, without all the messy clean-up. The portable fishbowl allows kids to bring their pet fish with them wherever they go! Includes repositionable background and name tag. HEXBUG Aquabot 2.0 is available in two styles, the Angelfish and Hammerhead Shark, and ten translucent colors. The Aquabot 2.0 swimmers are equipped with an inner pulsating LED glow and a hi-tech sensor allowing you to wake the sleeping fish by tapping on the tank. Styles and colors are selected randomly at time of shipment based on availability. — Mary Tague from Toy Town in Key Biscayne, Fla., told TDmonthly in an April 2015 survey that the Aquabot was their best-selling bath toy.